Flag measures 20" x 27"
During the American Revolution women were called upon to help their country. They were asked to design the new American flag. They were responsible for how the world would see our budding nation. How we would be perceived by other countries. These women were the backbone of early American life. They washed their clothes on washboard racks, and dried them on clothes lines. They did back breaking house work, as their men folk were off fighting against the British, for freedom from the king. Freedom from unfair taxation without representation. This year on Independence Day remember the women who helped make this great nation what it is today. Remember their hardships, and the backbreaking work they put in to give us our freedom from the British Empire. 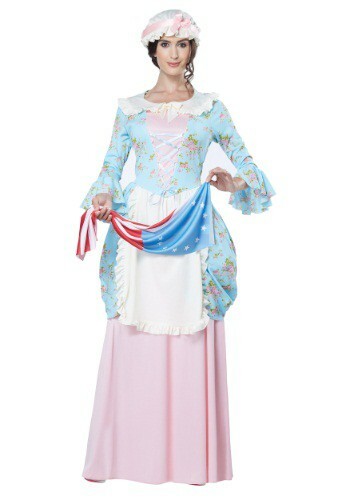 Wear this Women's Colonial Lady Costume to your 4th of July parade. And make sure you wave this thirteen-stared early American flag high as the veterans who fought for our freedom walk by. They will appreciate seeing a strong woman in a lovely colonial era dress who supports them. And although the flag has changed since Betsy Ross' original design, it still has the same power to all who see it.